It seems a day doesn't pass in which I do not meet another (financially) troubled soul. An apartment building which I represent, bringing in prospective leasees, has recently lost a number of tenants. I generally do very well to keep it at 100 percent occupancy, but we've recently slipped to 88, due entirely to tenant job losses. Two tenants are vacating to bunk with friends; a middle-aged professional lost her job and is moving in with family. Prospective tenants who have lost their homes in recent bankruptcies but have acquired new jobs are doing everything they can to ensure us of their ability to pay, offer co-signers, and pay several months in advance to accept them as tenants in spite of their recent credit failures. Others are taking in boarders and roommates. Times are tough, but the thing is, my homeless friend Ron, whom I ran into in the foyer of the McDonald's this afternoon, is completely unaware in that he pays no mind to economic uncertainty. In that regard, he may be one fortunate guy. I first met him a few years ago when I was tending to my container garden and heard him shoutin' kind of crazy-like from my neighbor's backyard two doors south. I grabbed five bucks from my wallet and said to myself, "Well, I guess I better go meet my Denver." And was surprised to discover his name, like Denver's best friend, was Ron. That's when I found out it was Ron who occasionally slept in my open carport, and was the person who unscrewed the motion-sensor floodlight so as not to re-awaken himself with its beam when he turned over. I thanked him for not discarding the bulb, but just loosening it. He said, "Oh, I would never take your lightbulb." Ever since I introduced myself and we became acquaintances, he has never spent the night in my carport again. I think I remember asking him not to, and he respected that. He said that day, "I worked 14 years for the City of Chicago, but a few years ago; well, I ain't goin' to lie to you; I went to the bottle." Yet he's cheery as ever. He has not noticed an economic downturn. I'm not sure where he sleeps, but occasionally family allow him to stay with them on super cold nights. Maybe there is a shelter he goes to. When I ran into him today, he was same as always (except a bit more sober than usual). He still collects metal and aluminum in exchange for cash at the recycle place just west of Clybourn Avenue. It was pouring a hard rain, but his smile and hug were big as ever when he noticed me duck in from the downpour. He says he keeps an eye on my place (I'm not sure if this is good or bad, but I keep it locked up like San Quentin), and so in return, when I had new windows installed in my home, saved the old aluminums for him to cart away in his "buggy," which is what he calls his grocery shopping cart. 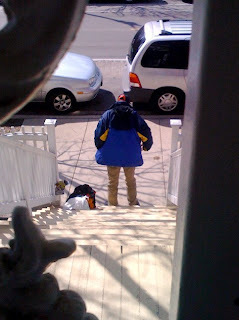 I think it is totally rude to take photographs of strangers (particularly of homeless people, as if they are some sort of object, a "sight" to be seen). 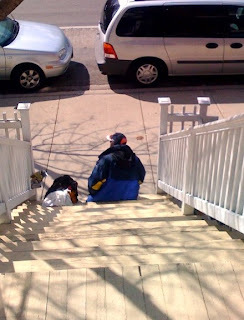 But sometimes Ron stops to rest on my front steps, and I was compelled to take this pic of the back of him recently. I have given him permission to sit there which he does maybe once a week. If I am expecting guests, I let him know and he immediately skedaddles. I don't want visitors to be frightened or unnerved by him sitting there. I also say, "Hey, I can see that beer can hidden behind your pack, just so you know. But I'm not calling police on you." In unrelated news, Abigail Disney, grandneice of Walt, sold her co-op on Manhattan's West End Avenue near $7.5 million, which was a paltry 46 percent discount from her initial asking price. I would like to see the film she produced -- Pray the Devil Back to Hell, but it's not playing in my area, although I wrote to the producer tonight in support of snagging a Chicago venue. The documentary is the story of ordinary, yet courageous women who organized to bring peace and stand against the horrors in Monrovia, Liberia. The trailer voiceover begins: "Money. Greed. Ethnicity. Absolute power. There is nothing that should make people do what they did to the children of Liberia." I'd chose my country's current recessionary troubles any day, a place I'd rather be than Liberia.